There are many things I like about Japan and it is not just the whisky. Being a graphic designer I tend to gravitate towards things that are well designed. Graphic design from Japan is yet another one of those things I love about the country. 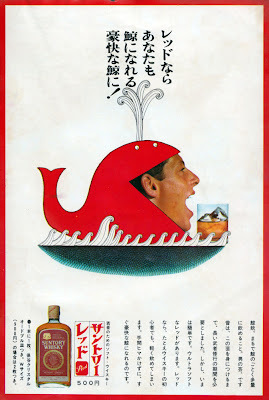 Thanks to a recent post from Nonjata, my attention was brought to a series of Suntory Red Adverts that I just could not ignore and had to repost. From a designers perspective there is nothing better than to find design that stands the test of time and feels as modern now as it did when it was concepted. Below is a slideshow off flickr by hosted by v.valenti I just had to post because the design is just so good. The 60's brought a lot of experimentation in to advertising that really has not been seen since, at least not her in the 'western world'. While the rest of us slid into the degradation of pop advertising singing to the masses, driven by trends while being to scared to be different form the next, Japanese advertising still keeps to these roots of challenging experimentation even today. Walk through a Tokyo metro station and the walls will be plastered with adverting that looks just like these. Complicated, unique, yet all too simple. So have a looksee and I hope you enjoy it as much s I do. Thanks again to Nonjata for the original post "Red can make you a whale! A really grand whale!" and be sure to check it out as it has some great translation of the text.